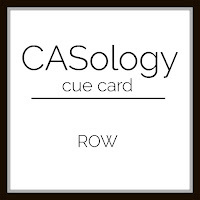 This card is for Casology Week # 204 cue word ROW, and Color Throwdown #399. The graphics for both challenges are at the bottom of this post. I send my Dad cards weekly with the find the difference puzzles from the Washington Post Sunday magazine. Sometimes coming up with a masculine card is difficult. Color choices make that a bit easier. When I saw the prompt for Casology, I knew I wanted to use Simon Says Stamp's Medium Dot Row die in some fashion. Checking out Color Throwdown gave me a good set of colors that can go either masculine or feminine. I die cut the bottom of the card front panel, then colored each of the dots with Memento markers and then clear heat embossed them for the color to hold up. Each dot was then replaced on a small foam square into its space. 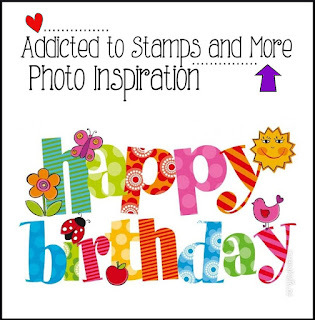 This card is for the birthday challenge in the form of a photo inspiration over at Addicted to Stamps and More. I was inspired by all the bright fun colors. I used a stencil by Clarity to loosely color in some circles with both Wink of Stella and Spectrum Noir Sparkle pens. Then I stamped the sentiment by Simon Says Stamp, I used my misti--but didn't use my magnets. I double stamped the sentiment because I wanted it nice an dark...my paper had moved just a bit but it is a happy accident, I love that little bit of blurr on the sentiment. I didn't want just a plain card base, so I embossed it with domed circles, this folder is from WRMK. Hi everyone. It feels so good to be back in my crafty space. The ideas just seem to flow better here. I miss my Dad, the two fuzzy ones and the lovely dry air, but this is now home for me. Today, I have a card for several challenges. I have been itching to play with this stamp set from Close to my Heart for a while. It is called Hawaiian Hibiscus, the set includes two views of the Hibiscus, two sentiments, a leaf and two smaller flowers...maybe ginger blossoms. I am using the Sketch from Cas(e) this sketch # 178, the colors are from the image at Inspired by All the Little things #21. I cut most of the image panel along straight lines, the bottom and right lower area are fussy cut along the sentiment and flower petals. 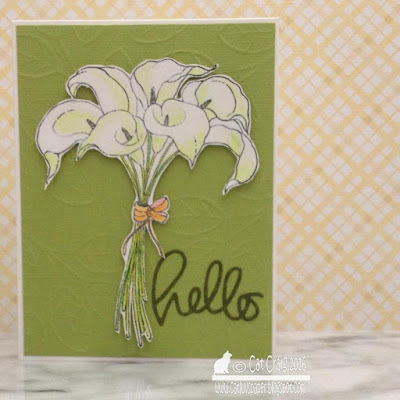 I embossed the card base with elegant dots from Stampin Up. This card is going to male friends of mine who used to live in Hawaii...so I can get away with the flower, but no extra embellishments. The main panel is adhered with foam tape. I am also submitting this to Anything goes Wednesday challenge at Simon Says Stamp. Thanks so much for stopping by~! One recent crafty Tuesday, I watercolored these cards. The stamp image is from WPlus9 - Beautiful Bouquets-Dahlia's. My Mom used to have Dahalia's and Zinnia's in the garden during summer time. I loved the bold colors and the tight petaled blooms. This is a super fun set to color. I got out my finally and newly aquired peerless watercolors and went to work filling in spaces that were left after the image was heat embossed. I cut the images out using Spellbinders A2 Distressed Die, and mounted them on to Michaels cream colored 110lb card stock. I don't like mounting watercolor paper on white bases. I added a few sequins in similar colors or clear depending on what I had on hand, and then used a bit of Spectrum Noir's sparkle pen in clear to add some shimmer. No sentiments for the fronts...Truthfully, I have no idea where to put them. No worries, these will make great note cards. I played again with Technique Tuesday's Pansy stamp. I gave some no-line copic coloring a go. They really have a velvety look IRL. Hi there...still in California. It is BLAZING HOT today 108 and its barely past noon. A friend of mine is feeling poorly so I whipped up this quick card to send off to her. I did buy a couple of stamp sets recently, one being WPLUS9's Get Well Gang - the images are adorable and the sentiments fit so many needs. Thank you's for when someone takes care of you, wishes for recovery and even a missing you. I used some PPP sequins (wisteria blooms mix), Grape Jelly Memento ink, Tuxedo Black Memento Ink, colored pencils and gamsol. I had such a hard time this year with the Father's Day cards. I needed to get them made ahead of my trip, and that kinda cramped my mojo. I ended up making 14 cards during two weeks in May for must have deadline reasons. They didn't all get posted, and some will be posted this month. Sometimes my cards get to the post office without a stop at the photo station! Usually when I have a lot on my mind. My hands down favorite all time wood grain stamp is the one from Stampin Up. Its a nice cling type red rubber stamp. I stamped it twice in two different inks on two types of paper, one for the base one for the flag. I added some brass colored brads to the flag - I think they look like nail heads, right? The baseball looking font for the sentiment comes courtesy of a CTMH stamp. Hi after all they should be blooming about now right? I used the same inks as in this post. Hi there. I am in California visiting and house-sitting for my Dad. I brought a few crafty supplies with me, some altenew mini ink cubes, my folder of peerless watercolor squares, and a few flower stamps. I forgot my misti, but tried to make due with an old fiskars stamp press. It was frustrating, though and eventually I bought a new set of colored pencils and mini misti on one of my outings with a scrappy friend. I am writing down the things I wish I had with me; so the next time I travel, I can have a nice little crafty box to take along. It is also a bit difficult mentally, as I am not in my usual crafty spots...I guess I am a creature of habit. I like my routines. I didn't bring any sentiment sets, just 3 flower sets. Fortunately I had an old set from fiskars I believe. I picked up a stamp and die set from Close to my Heart. It is perfect for making card sets. These 10 were made with an embossing folder, an alternate sentiment set and some glitter pens. Total prep and completion time about 90 minutes, it was a perfect project for my crafty Tuesday. I love flowers, bet you couldn't guess that from my cards? Just kidding. Technique Tuesday has some lovely flower images. This is the camellia, so pretty and I love those big petals for coloring. I am looking forward to a no line version in the future. I have another card going over-seas to England this month. If you are not familiar with the card chain challenge, it is a monthly card exchange world wide. You sign up and send a card to the person ahead of you. If you are the last to sign up, the first person to sign up will send you their card. Deborah has it all nice an tidy. All of the sent cards are posted at the first of the next month on Deoborah's blog. I loosely followed the colors and the sketch this time, along with using colored pencils to fill in my stamp. I hope Jane likes the card. The June sign up is still open, and you can join in here. Please enjoy content of this blog for personal craft inspiration only. If you find inspiration here and CASE please link back to my post. Do not copy photos, cards, crafts, for monetary gain, contests, or publication submissions. All contents are copyright(c) Cat Craig, 2012, 2013, 2014, 2015, 2016, 2017, 2018 and 2019.